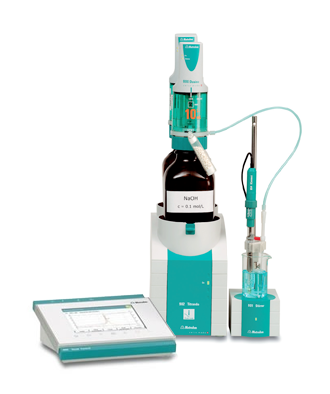 Meet Metrohm’s newest enzymatic and pH STAT titrator. The 902 Titrando is designed with advanced technology and true convenience. It utilizes our exclusive and popular Dosino® top down dosing system and features the revolutionary Model 807 Intelligent Dosing Unit with built-in intelligence to recognize and remember all your reagent parameters for successful titrations each and every time. The 902 Titrando is perfect for all of your enzymatic and pH STAT titrations! And here’s more reasons to consider the 902 Titrando for your next STAT titrator. Simultaneous multiple modes for all of your analyses: With a second input board (sold separately) the 902 Titrando can simultaneously run two titrations or other measurement functions: STAT constant pH titrations, STAT enzymatic activity titrations and SET pH and mV fixed endpoint titrations! 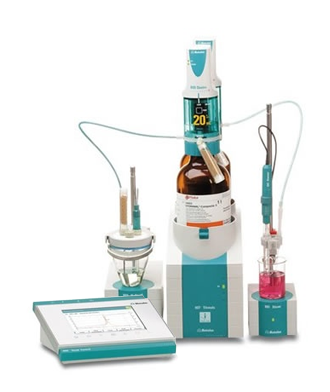 Fully intelligent titration: The 902 Titrando features built-in intelligence—recording, storing and recalling all the info you need about your titrator and your titration when you need it. Smart Chips are built into all serial numbered portions of the instrument, from the Intelligent Dosing Units to the iTrode® intelligent electrode This built in intelligence saves you from having to record this information yourself and maintains complete traceability for your own GLP and standard government guidelines (like 21 CFR Part 11). Safe & automatic reagent addition. Connect up to 4 dosing units for additional titrations, the aspiration and addition of solvents, standards or auxiliary reagents such as buffer or solubilizers. Because the addition is fully automatic, your handling of caustic and hazardous reagents is minimized, and there is no forgetting to add reagent at critical points of the analysis! Just hit start and walk away, you can work on something else while Titrando watches over your application for you. Super-accurate titrant and reagent dispensing. Our Dosino® dosing systems sport a patented “top-down” technology to eliminate the build-up of air bubbles (typical of “regular” dosing systems) which negatively impact results and reproducibility. And because these units actually sit on top of the bottle, they are a huge space-saver as well—doubly valuable for any lab short on bench space! The 904 Titrando is designed with advanced technology and true convenience. It utilizes our popular Exchange Unit dosing system and features revolutionary Model 806 with built-in intelligence to recognize and remember all your reagent parameters for successful titrations each and every time. But here’s where the “true” convenience comes in: this Titrando accepts older Exchange Units—going as far back as 30 years—because we know those old workhorses are still out there, with years of dependable service left in them! And here’s more reasons to consider the 904 Titrando for your next titrator. Simultaneous multiple modes for all of your analyses: With a second input board (sold separately) the 904 Titrando can simultaneously run two titrations or other measurement functions: DET dynamic endpoint seeking titrations, MET monotonic fixed increment endpoint seeking titrations, SET fixed endpoint and MEAS pH measurement modes along with standard addition modes for potentiometric measurement using Ion Selective Electrodes! Fully intelligent titration: The 904 Titrando features built-in intelligence—recording, storing and recalling all the info you need about your titrator and your titration when you need it. Smart Chips are built into all serial numbered portions of the instrument, from the Intelligent Dosing Units to the iTrode® intelligent electrode This built in intelligence saves you from having to record this information yourself and maintains complete traceability for your own GLP and standard government guidelines (like 21 CFR Part 11). The 905 Titrando is designed with advanced technology and true convenience. It utilizes our exclusive and popular Dosino® top down dosing system and features the revolutionary Model 807 Intelligent Dosing Unit with built-in intelligence to recognize and remember all your reagent parameters for successful titrations each and every time. The 905 Titrando is perfect for all of your potentiometric titrations! And here’s more reasons to consider the 905 Titrando for your next titrator. Simultaneous multiple modes for all of your analyses: With a second input board (sold separately) the 905 Titrando can simultaneously run two titrations or other measurement functions: DET dynamic endpoint seeking titrations, MET monotonic fixed increment endpoint seeking titrations, SET fixed endpoint and MEAS pH measurement modes along with standard addition modes for potentiometric measurement using Ion Selective Electrodes! Fully intelligent titration: The 905 Titrando features built-in intelligence—recording, storing and recalling all the info you need about your titrator and your titration when you need it. Smart Chips are built into all serial numbered portions of the instrument, from the Intelligent Dosing Units to the iTrode® intelligent electrode This built in intelligence saves you from having to record this information yourself and maintains complete traceability for your own GLP and standard government guidelines (like 21 CFR Part 11). The 906 Titrando is designed with advanced technology and true convenience. 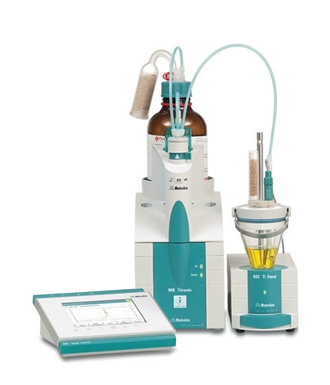 It utilizes our popular Exchange Unit dosing system and features revolutionary Model 806 with built-in intelligence to recognize and remember all your reagent parameters for successful titrations each and every time. But here’s where the “true” convenience comes in: this Titrando accepts older Exchange Units—going as far back as 30 years—because we know those old workhorses are still out there, with years of dependable service left in them! And here’s more reasons to consider the 906 Titrando for your next titrator. Simultaneous multiple modes for all of your analyses: With a second input board (sold separately) the 906 Titrando can simultaneously run two titrations or other measurement functions: DET dynamic endpoint seeking titrations, MET monotonic fixed increment endpoint seeking titrations, SET fixed endpoint and MEAS pH measurement modes along with standard addition modes for potentiometric measurement using Ion Selective Electrodes! 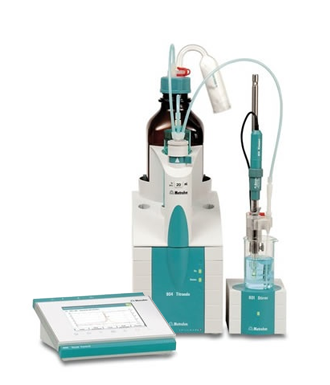 Fully intelligent titration: The 906 Titrando features built-in intelligence—recording, storing and recalling all the info you need about your titrator and your titration when you need it. Smart Chips are built into all serial numbered portions of the instrument, from the Intelligent Dosing Units to the iTrode® intelligent electrode This built in intelligence saves you from having to record this information yourself and maintains complete traceability for your own GLP and standard government guidelines (like 21 CFR Part 11). Meet our newest all purpose potentiometric and Karl Fischer titrator that features Dosino top-down dosing! The 907 Titrando is designed with advanced technology and true convenience. It utilizes our exclusive and popular Dosino® top down dosing system and features the revolutionary Model 807 Intelligent Dosing Unit with built-in intelligence to recognize and remember all your reagent parameters for successful titrations each and every time. The 907 Titrando is perfect for all of your potentiometric titrations! And here’s more reasons to consider the 907 Titrando for your next titrator. Simultaneous multiple modes for all of your analyses: With a second input board (sold separately) the 907 Titrando can simultaneously run two titrations or other measurement functions: DET dynamic endpoint seeking titrations, MET monotonic fixed increment endpoint seeking titrations, SET fixed endpoint and MEAS pH measurement modes along with standard addition modes for potentiometric measurement using Ion Selective Electrodes! Fully intelligent titration: The 907 Titrando features built-in intelligence—recording, storing and recalling all the info you need about your titrator and your titration when you need it. Smart Chips are built into all serial numbered portions of the instrument, from the Intelligent Dosing Units to the iTrode® intelligent electrode This built in intelligence saves you from having to record this information yourself and maintains complete traceability for your own GLP and standard government guidelines (like 21 CFR Part 11). With the 888 Titrando for potentiometric titration, Metrohm opens up the Titrando world for the price-conscious customer. Designed for routine analysis in titration laboratories and are aimed at all those who, with a restricted budget, nonetheless make the highest of demands in terms of usability, data management and automation, as well as traceability of analysis results. The 888 Titrando is the perfect system for analyzing anything from acid number to surfactants. Operating the Titrando System is simple and intuitive! Multiple modes for all of your analyses: DET dynamic endpoint seeking titrations, MET monotonic fixed increment endpoint seeking titrations, SET fixed ("set") enpoint and MEAS pH measurement modes along with standard addition modes for potentiometric measurement using Ion Selective Electrodes! Choose your control: Touch Control features easy-to-use instant-access buttons and a large and easy-to-ready screen—titration has never been so easy! Or choose computer control and the 888 Titrando will include tiamo® Light— Metrohm's very own easy-to-use software interface! Automatic reagent addition. Connect up to 4 dosing units for the aspiration and addition of solvents, standards or auxiliary reagents such as buffer or solubilizers. Because the addition is fully automatic, there is no forgetting to add reagent at critical points of the analysis. The 888 Titrando keeps you safe by reducing your handling of potentially hazardous reagents! Accuracy-ensured Dosino® reagent dispensing. Our patented “top-down” dosing technology eliminates the build-up of air bubbles that will negatively affect results and reproducibility. Did you also know that it saves valuable bench space? If you’re not familiar with this unique, space-saving technology, read up on Dosino dispensing here.